As plants developed flowers millions of years ago, insect presence and natural selection interacted and a co-evolution of insect body parts and flower structures took place. You may have observed a bee fitting perfectly into a tube flower as the stamens powder its abdomen with pollen. Or maybe seen the proboscis of a butterfly able to just reach the nectar source at the bottom of a flower spur. While not all flowering plants (angiosperms) are insect-pollinated (e.g., trees and grasses have flowers but are mainly wind-pollinated), many cannot persist without insects. Like many groups of organisms in nature, there are generalist and specialist insects involved in plant pollination. Generalist insects may be able to feed upon pollen and/or nectar resources from a wide variety of flowering plants while specialists have co-evolved with a particular plant family, group or even species. One Midwestern example of specialized pollination are hawk moths that pollinate the federally-threatened, eastern prairie fringed orchid. Pollinating insects may be bees, beetles, butterflies, moths, wasps, flies, and ants while some mammals, such as bats and rodents, and birds (e.g., hummingbirds) can also pollinate plants. While the non-native, European honeybee is known for its domesticated production of honey, it also plays a vital economic role in plant pollination of crops. Human societies also rely on free pollination services provided by a wide variety of native insects around the world to produce viable fruit, nut and seed crops. This service allows for billions of dollars of crop yields to be distributed around global food system markets every year. 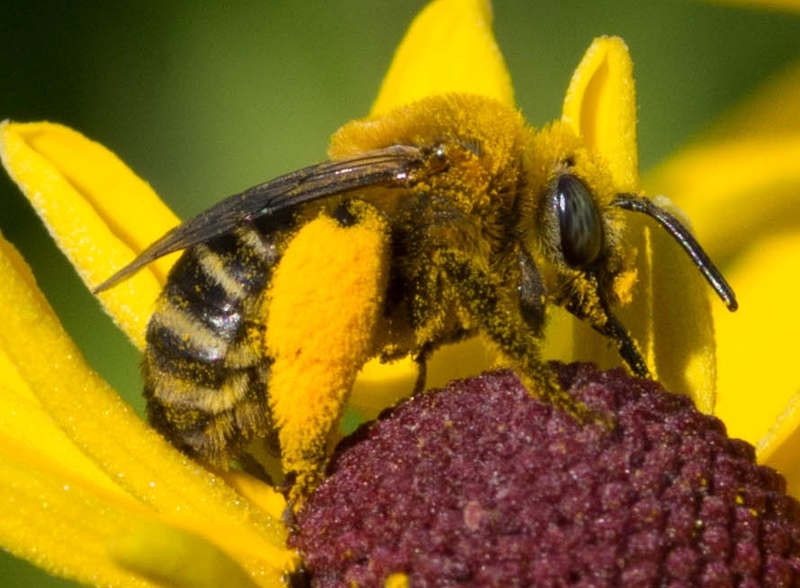 Protecting and promoting pollinators amounts to protecting and restoring large swaths of diverse habitat. Remnant prairie, woodland or wetland have been found to be very important refugia for rare insect species and should be protected and studied. In some cases, focusing on individual species is important, especially if they are specialized for pollination. The rusty-patched bumblebee (Bombus affinis) is one such species in need of focused conservation and was listed as federally endangered in 2017. It is found at Fermilab and is a Chicago Wilderness priority species.